Although June has long passed, we’re still thinking about weddings at the arts council. This is because we were recently forwarded a great e-mail from Kentucky Crafted artist Mark Needham explaining how he turned one couple’s flimsy but significant memento into an heirloom piece of art. The tale covers three years and most of the Commonwealth. It’s the story of the showy and wonderful things we do to celebrate life’s big events, but also the sweet, private things that can often mean so much more. 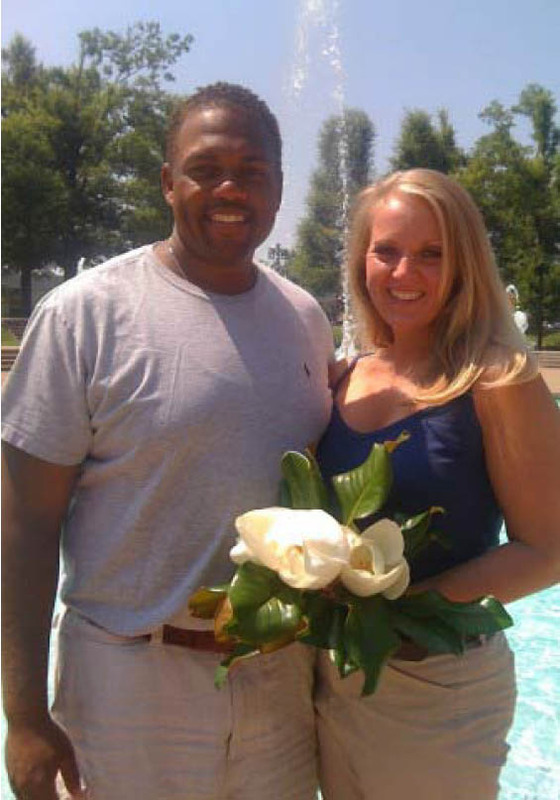 Greg and Shavonna met in October of 2009 at Western Kentucky University’s Leadership Assessment Center in Bowling Green. During that time, they struck up a friendship. Although they lived in different cities, they kept in touch. After many e-mails, texts and phone calls, they had their first date on Valentine’s Day of 2010. In March, Greg presented Shavonna with a vending machine ring from a Chinese buffet in Louisville. He called it his “practice proposal.” Appreciating the sentiment behind the gesture, Shavonna kept the ring. His official proposal took place in early May of 2010, with a wedding planned for August. But Greg couldn’t wait. Shavonna visited him in his hometown of Paducah over Father’s Day. As she was packing to leave, she received a text reading “Why don’t we just go ahead and get married today? !” She said yes, and although she had to wear the same clothes she wore the Sunday before, she was able to carry real magnolias from her sister-in-law’s yard to the Justice of the Peace. Anyone who has ever tried to buy fresh magnolias knows that’s a fancy bouquet! Greg was concerned that he wouldn’t have a ring for her, but Shavonna saved the day by pulling out the presumed-forgotten vending machine ring. After a brief honeymoon in Mayfield, they had to return to their separate cities. Shavonna and Greg did have a “real”ceremony in August, and were finally able to be together in the same city! The vending machine ring broke (it wasn’t built for long-term use), and she wore her grandmother’s plain gold band instead. Greg surprised her on their first anniversary with a solitaire, although she had actually asked for a digital camera (luckily she got that, too). Shavonna and Greg have been happily married for two years, and they have an exceptional little family. This past May they visited Paducah’s annual Lowertown Arts and Music Festival. As they browsed the artists’ booths, they found Mark Needham from Louisville. Given the nature of his beautiful jewelry, Shavonna immediately told him about the broken vending machine ring she had kept all this time. She commissioned a “renewed” ring to wear on her right hand. Although this story belongs to Shavonna and Greg, we think it illustrates a great point about buying handmade items from Kentucky artists. Artists do more than create art; they are also creative thinkers with the ability to turn “old nothings” into “new somethings.” Is there a trinket or a piece of ephemera in your life that could use the artists’ touch?